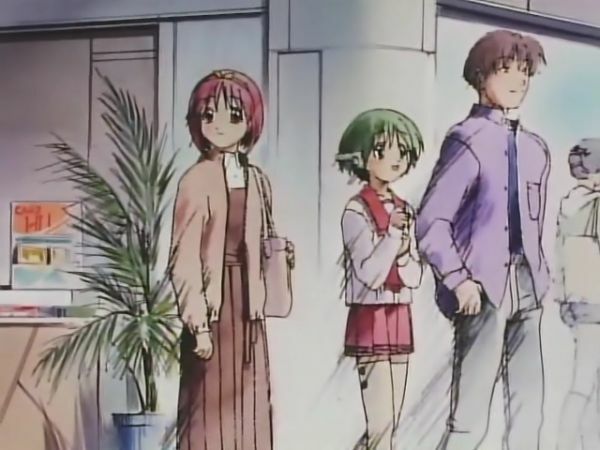 Screenshot from the original “To Heart” anime. The conservatively dressed redhead is our heroine, the young man is her childhood friend, and the robot-eared girl is one of the many who like him. This anime is from 1999, and you can see that. Technology really is progressing, styles changing subtly as well. And I think it was intentionally a little “retro” even back then. For me, it was one of the first – if not the first – romantic anime I saw that was not meant to be hysterically funny or dramatic. Even today this is fairly rare, it seems. And the anime is also very decent (but the PC game not at all so, from what I have been told). So, it is not funny, dramatic or indecent, what is it then? It is a calm slice of life story about four friends and some of the people at their school. But most of all it is the story of a girl and the childhood friend she loves. A love that is quiet, confident and accepting. She does not get upset when she sees him with other girls, although you can see a shadow of worry in her eyes sometimes. And he makes many friends, because he is the type who does something when he sees a need, instead of waiting for others to fix it. But in the end, she is the one he can always rely on, and she on him. I really loved this story, but I usually don’t watch movies twice unless they are of a spiritual nature. I don’t think you can quite call this one that. A big part of why I remember it so well (apart from the enjoyable calm) is the ending song, which stirs my heart still. I guess I am wired for that kind of music, but it is even better with Anime-Galaxy’s original (and rather inaccurate) translation. I know I have quoted it twice in the original Chaos Node. The first time I quoted it, I think, was May 19, 2003. I mention the anime there, briefly, and also says that I wanted it to be the end of my novel. Did not mention which novel, but my guess would be “Lost in Magic”, the one about the boy who is accidentally summoned to a magic fantasy world and wants to save it, but there is nothing to save it from. A few days later, I mention it again, in connection with my Dark Age of Camelot character, but both of them in context of my drifting apart from my best friends through many years, the amazing Supergirl (later Superwoman, by her own request, but the truth is that to me she was always a girl, and that was probably one of the big differences between us.) Actually, the complete calm and rare trust that I felt in that friendship reminded me a lot of this anime, or rather the anime reminded me of real life. Then on December 20 the same year, when I made the irrevocable decision to stop visiting. I said I had reserved this song for that occasion, and that is true. It reads as if written for just such a day. after spending those innocent moments together. but we can’t go back to that place now. Let’s try a translation closer to the Japanese original, I think. May still be a bit off, by all means. real life has lately hurt a little bit. but there is no returning to that. You know, that sounds a bit “raw”. Even back in 2003, it did not hurt enough to make a black entry. And walking away from that place has led me to something wonderful. But I do not want to edit the past. I don’t need to make it better or worse than it was. I want to keep that same warmth in my heart, always. This entry was posted in autobiography, meta, slice of life and tagged anime by itlandm. Bookmark the permalink.